Teens in Tucson, Arizona, led Border Patrol agents on a chase on Dec. 9, after they fled an inspection, according to the U.S. Customs and Border Protection. Agents from the Nogales Station Interstate 19 Immigration Checkpoint arrested a male driver and a female passenger Saturday night after they sped off from the checkpoint. Two illegal immigrants were found in the trunk of their car, the agency said. 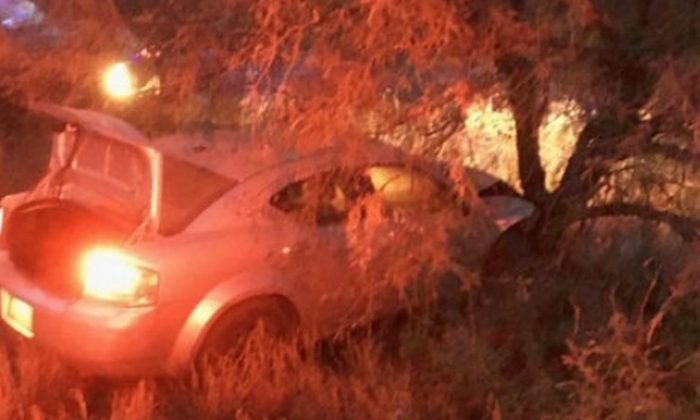 “Agents attempted to perform an immigration inspection on the driver and passenger of a Dodge Avenger, who then fled from the checkpoint at a high rate of speed and subsequently lost control and crashed on Interstate 19 near post 45 in Arivaca, Arizona,” a Border Patrol release reads. They found a 24-year-old Mexican woman and a 19-year-old Mexican man hidden in the vehicle’s trunk. The 19-year-old driver and 18-year-old passenger, who were both from Tucson, were arrested for human smuggling. The Mexican citizens were arrested for immigration violations, the release stated. “No one involved in the crash required medical attention but Border Patrol officials continue to warn the public about the dangers of riding in the trunk,” the agency said. Border Patrol agents said that people can report suspicious activity to the Border Patrol and remain anonymous by calling 1-877-872-7435 toll free.